Another view of Spruce Tree House in Mesa Verde National Park. Here you can see a ladder leading to an underground chamber, probably a “kiva” used for religious purposes, according to the anthropologists. 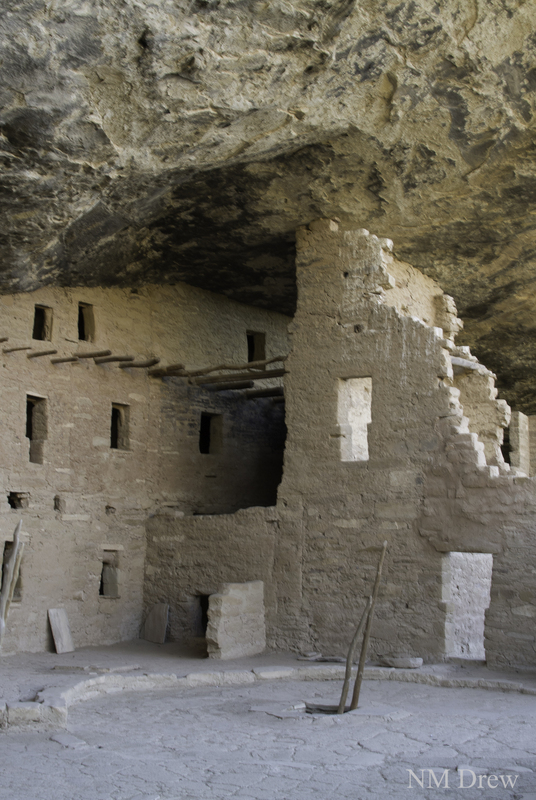 Spruce Tree House is the best preserved of all the cliff dwellings in Mesa Verde. Because they are made of the local, soft stone, coupled with mud for slurry and covering the stones, the Park Service does routine restorations on all the dwellings. This keeps them from slowly decaying and dissolving in weather and rain. This entry was posted in Glimpses and tagged "photography", cliff dwelling, Colorado, Four Corners, Mesa Verde, Nikon 18.5mm f1.8, Nikon V1, Spruce Tree House. Bookmark the permalink. This reminds me a bit of Capadoccia in Turkey, rock dwellings are so cool, lovely shot. I think they are cool, too. Makes me wonder what it was like to live in them. No plumbing . . . but are they warm in winter and cool in summer? I’ve a few more to post of these!